It is accented by a brilliant cut diamond on each side. This is a pretty ring. It is in nice shape with an approx total weight of 1.05 cts (6 mm x 8 mm). MATERIAL: 14K yellow gold (marked). This is not an appraisal or actual value of the piece. We have our own factory, We can help you customize product.925 Sterling silver,Stainless Steel,White Gold Filled,Yellow Gold Filled ,Rose Gold ,Ring ,Earrings,bracelet,necklace. 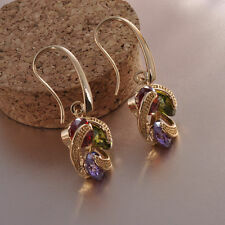 Earrings Weight:8 g. Main Stone Size(Approx):10 7mm. (If the information does not match, your order may be cancelled. We keep you updated regarding the status of your order. 2) Item must nothave been sized or customized in any way. Then there are two oval red garnets. They are all in nice shape with an approx total gemstone weight of 3.50 cts. MATERIAL: 14K yellow gold (marked). This is not an appraisal or actual value of the piece. Designed with flair crafted with care. These exclusive stud earrings heart cut 6x6mm stones are embedded in rose gold plated 925 Sterling Silver. The precious gems are professionally hand-set into a 3 prong setting that secure and fasten the stone. Ring Size 7. Well Crafted / Nice Quality Solid Ring. The stone is set in a rose gold solitaire setting. Size 9 (resizable). 14k Rose Gold.